Computer science students display their project, Tint, which won the Project Display category for the Computer Science Department. Adriana Davila, Adrian Gonzalez (captain), Michael Piechota, Keiko Yamane and Yiming Zhao received guidance for their project from faculty advisor Felix Rabinovich. Photo by David J. Hawkins. 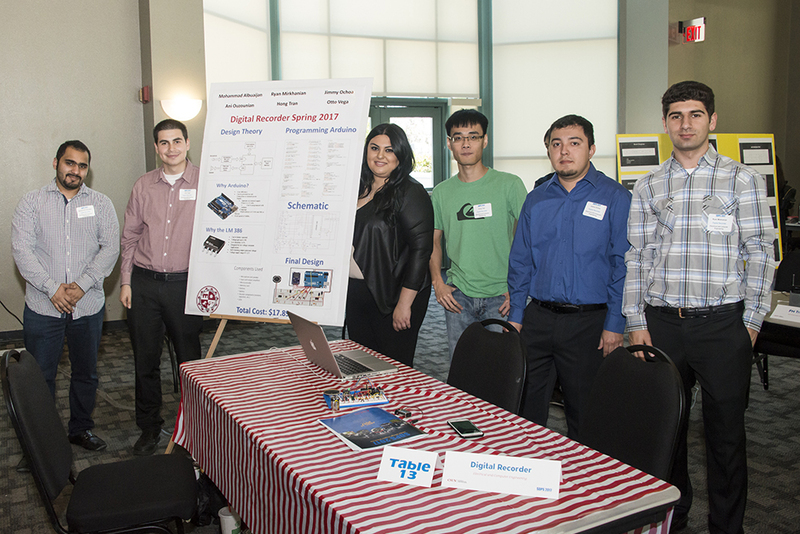 With the help of faculty advisor Ichiro Hashimoto, electrical and computer engineering students Mohammad Albuaijan, Ryan Mirkhanian (captain), Jimmy Ochoa, Ani Ouzounian, Hong Tran and Otto Vega present their project called Digital Recorder. Photo by David J. Hawkins. 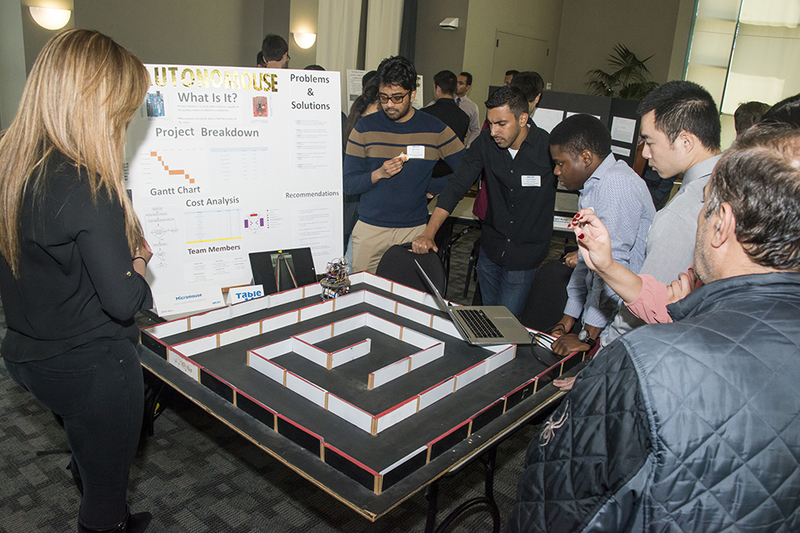 Students Fatima Ahadi (captain), Yousef Alaskar, Adeola Bello, Mark Desai, Thomas Ruiz and Chenchin Yeh display their project called Micromouse. Their faculty advisor was Ruting Jia from the Electrical and Computer Engineering Department. Photo by David J. Hawkins. Computer science students Sean Holst, Clyde Lee, Kevin Liu, Ye Ma, Ryan Scopio (captain), Scott Spencer, Yuting Tse and Kyung Yu worked with faculty advisor Patricia Dousette to present their project Super One Punch Team Turbo HD Remastered II. This project won the Project Display award for the Computer Science Department. Photo by David J. Hawkins. 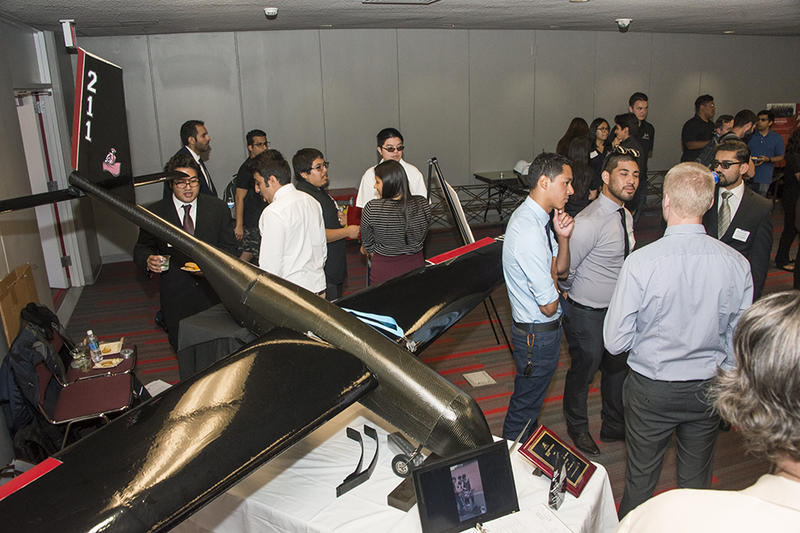 CSUN Aeronautics display their project with the guidance of faculty advisor Vibhav Durgesh. Their project won the category of Project Display for the Mechanical Engineering department. Photo by David J. Hawkins. 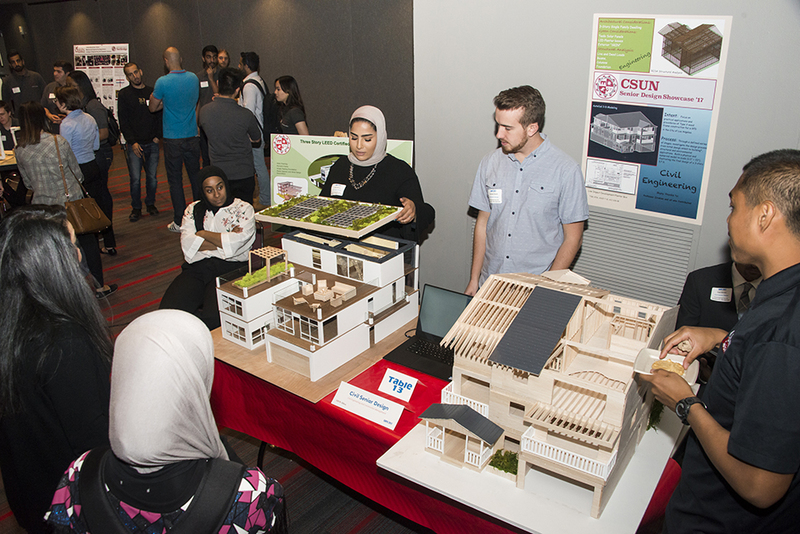 Civil and construction management students Laila Alkhars, Waed Barakat, Christian Daniel, Joseph De Guzman, Leo Dio, Mark Galang, Samuel Gonzalez (captain), Kyle Kovacs and Jason St. Pierre present their project — Civil Senior Design. Photo by David J. Hawkins. 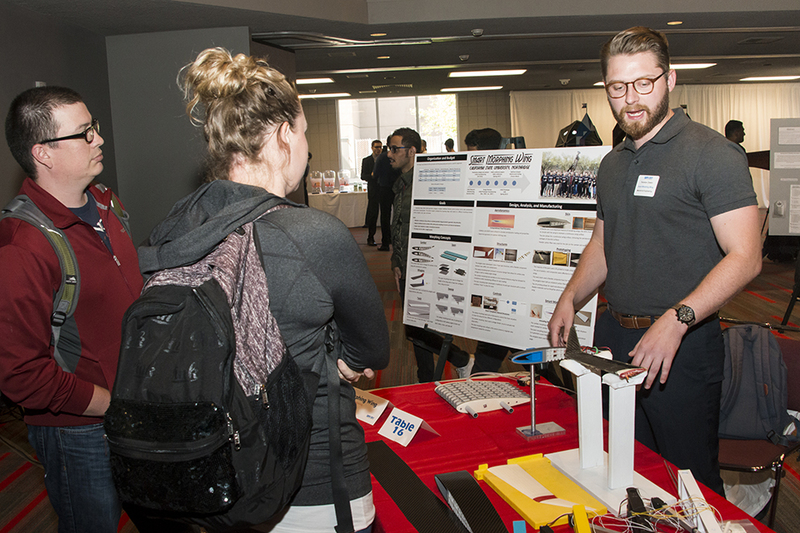 Under the advisement of professor Peter L. Bishay, 26 mechanical engineering students displayed their Smart Morphing Wing project at this year's Senior Design Project Showcase. Photo by David J. Hawkins. 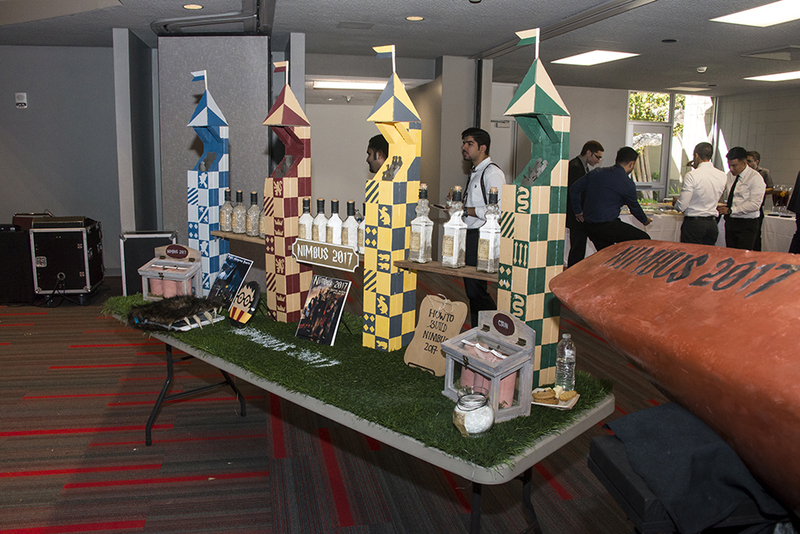 CSUN Civil Engineering and Construction Management students present their concrete canoe, the Nimbus 2017. Photo by David J. Hawkins. 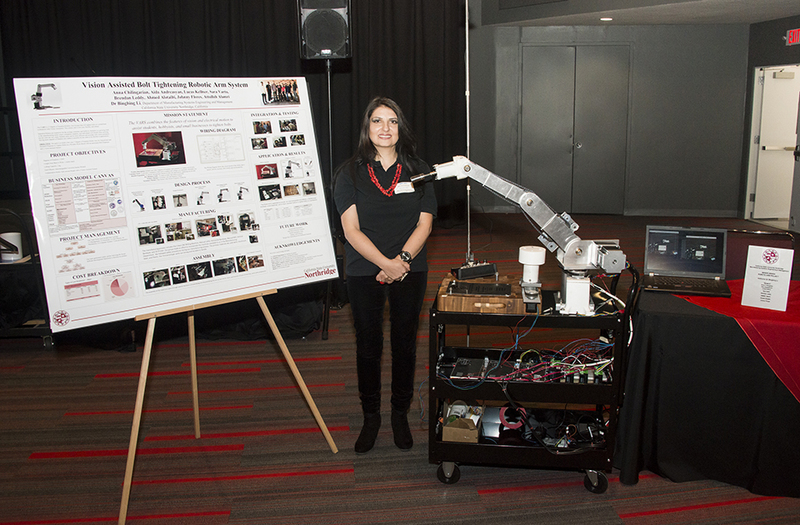 A group of CSUN Manufacturing Systems Engineering and Management students presented their project, a robotic arm, at this year's Senior Design Project Showcase. One of the hardworking students poses with their project at the 2017 SDPS. Photo by David J. Hawkins. CSUN President Dianne F. Harrison chats with Dean of the College of Engineering and Computer Science S.K. 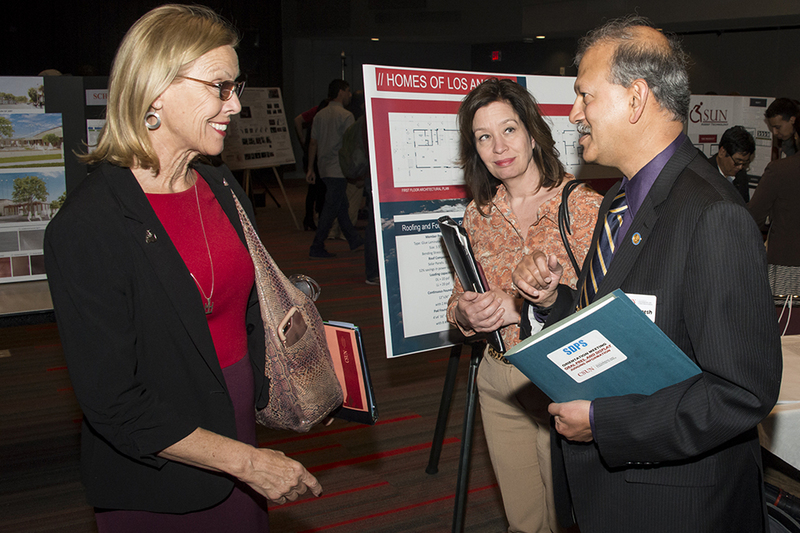 Ramesh and Chief of Staff Jill Smith at the eighth annual Senior Design Project Showcase. Photo by David J. Hawkins. 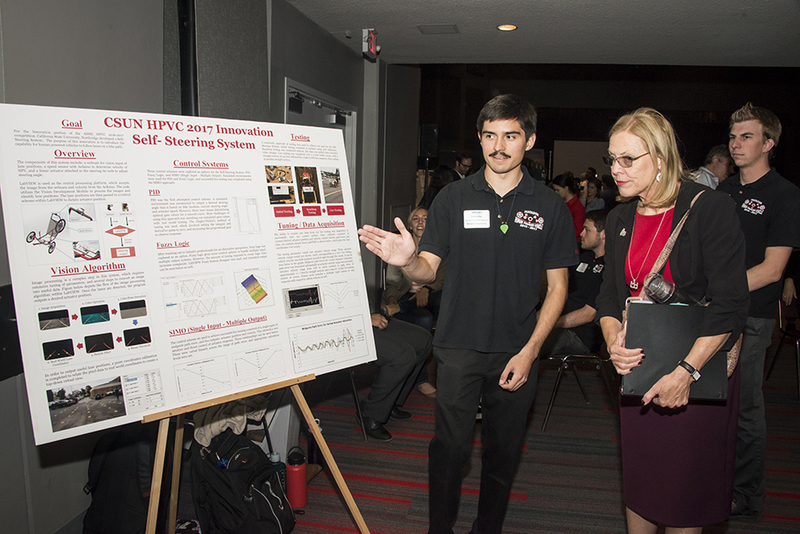 The CSUN Human Powered Vehicle Team presents their project to CSUN President Dianne F. Harrison during the Project Display portion of the Senior Design Project Showcase. The Human Powered Vehicle Team won the grand prize and the oral presentation prize for the mechanical engineering department. Photo by David J. Hawkins. 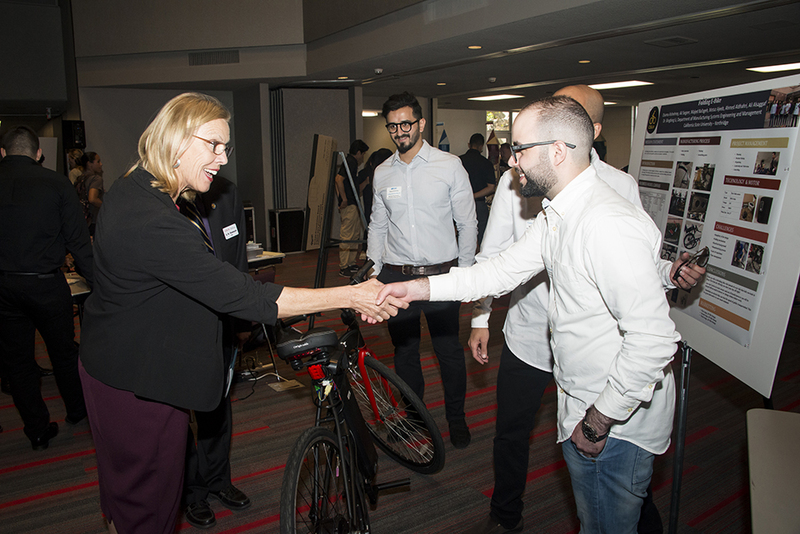 A group of six manufacturing and systems engineering students present their project, Folding Electrical Bicycle, to CSUN President Dianne F. Harrison. The Folding Electrical Bicycle won both the Oral Presentation and the Project Display portion of the showcase for the Manufacturing Systems Engineering and Management Department. Photo by David J. Hawkins. 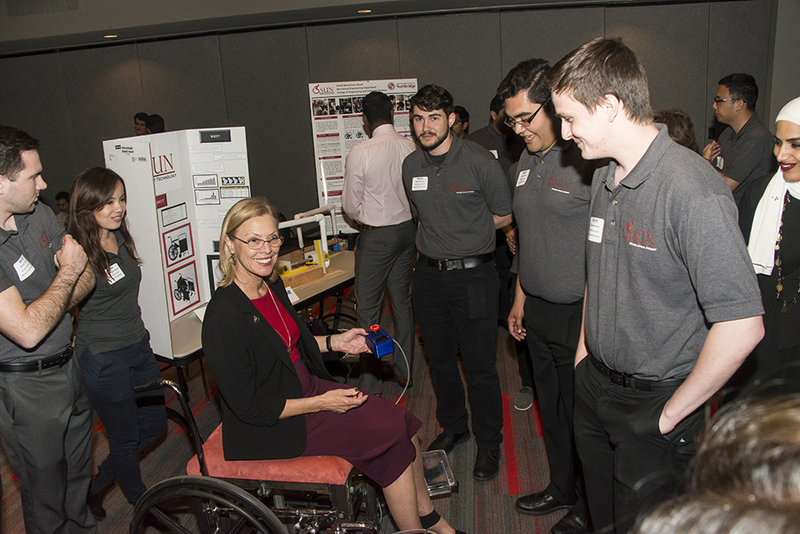 Mechanical engineering students display their project, Wheelchair Assist, to CSUN President Dianne F. Harrison at this year's Senior Design Project Showcase. Photo by David J. Hawkins. 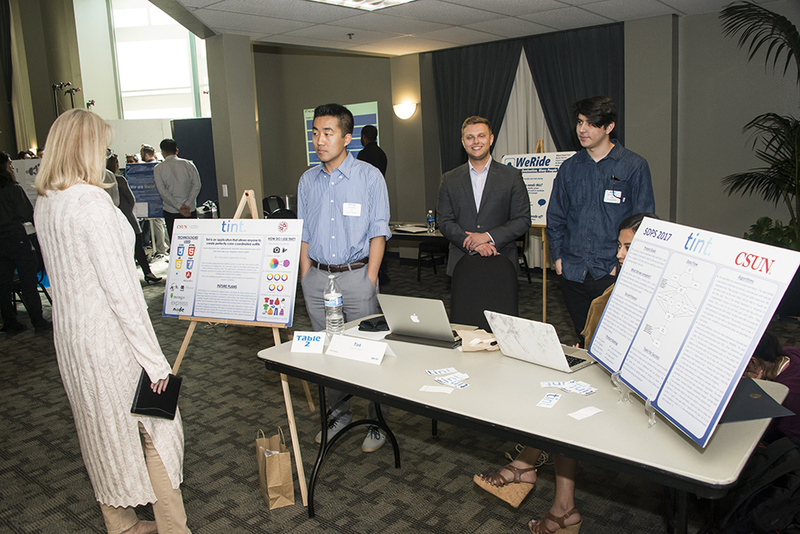 The California State University, Northridge College of Engineering and Computer Science hosted the eighth annual Senior Design Project Showcase on April 14. 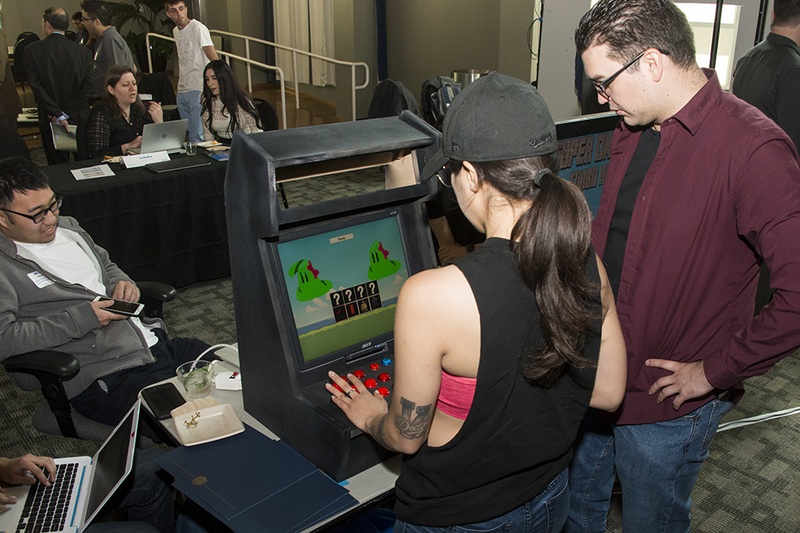 The showcase, which filled the Grand Salon and Northridge Center of the University Student Union, featured an automatic wheelchair, a concrete canoe and an electric bicycle, among many other student projects. Gilberto Rosales, a mechanical engineering major, is the project manager for engineering design of the CSUN wheelchair that will assist and give independence to people who have a disability or are recovering. Rosales said that CSUN’s Department of Mechanical Engineering faculty and staff have been a huge help with the group’s project. Motaz Ajeeb, a senior majoring in manufacturing systems engineering, was one of six students who worked on a pedal-less, electric, foldable bicycle for his senior design project. According to Ajeeb, the project took about a year to complete.